As indicated on the box, the hood should be connected and tested prior to installation; if the hood works properly at that time but a problem arises after installation, the problem is not due to the hood but to improper installation somewhere between the hood and the outside vent. The suction power seems to be approximately the same for all settings. Did you remove the protective adhesive strip on the flaps? Did you install the duct too tightly over the flaps, preventing them from opening fully? To quickly check whether the valves are operating properly, run the hood for 30 second then turn it off. After 2 or 3 seconds, you should hear the two flaps close one after the other. 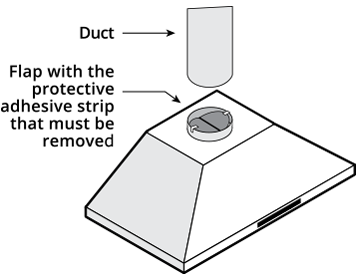 The duct connecting the hood to the outside should be the same diameter as the hood’s outlet (typically 6 inches) and be free of obstacles. Caution! Never put an angled duct right at the outlet of the hood. 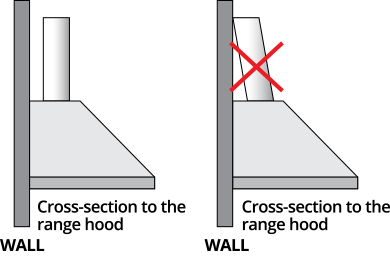 If the hood is mounted on a glass-ceramic wall, it may seem noisy at the lowest setting. This can be fixed by installing a piece of 1/2-inch foam rubber between the hood and the wall.